Roofing · Windows/Doors · Siding · Heating/A.C. Application must be submitted with an accurate site plan showing the location of the proposed work and identifying all existing structures, proposed structures, exterior dimensions, and property lines. The site plan does not need to be to scale; HOWEVER, it must include accurate measurements and dimensions of property lines, setbacks, existing structures, and proposed structures and/or additions. Applicant must physically flag/identify exterior improvements and any and all applicable property boundaries for setback verification prior to submittal of the application. Actual flagged dimensions must match the application. Permits will not be issued until all setbacks are verified. Floor plans are required for all Residential Dwelling Improvements. Full project plan sets are required to be submitted for Commercial Building Improvements. Incomplete applications will not be accepted. If something does not apply please mark – N/A. Application fees must be paid at the time of submission. Permit fees may be paid at the time of submission, but must be paid upon approval and must be paid prior to beginning of any work. A permit will be issued upon satisfactory review of the application and plans, verification of project setbacks, and receipt of all appropriate fees. DO NOT START ANY WORK UNTIL THE SETBACKS HAVE BEEN VERIFIED AND A PERMIT HAS BEEN ISSUED. 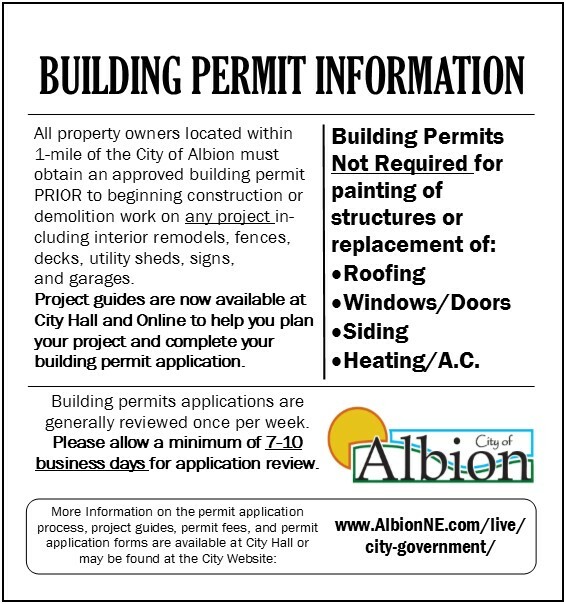 Applications for Building Permits are generally reviewed within 7-10 business days. The adopted ICC Building Codes, Albion Zoning and Subdivision Regulations and other applicable ordinances/codes which apply to the erection, location, and use of the structure described in the building permit application will be utilized and reviewed during the application review as well as the physical inspection of the project site. A Quick Reference plumbing code guide book is also available for purchase at City Hall. These Quick References provide guidance for common issues regarding specific project types but do not contain all of the requirements of the Albion Building and Zoning Regulations. Applicants may also schedule a consultation with City Administrator and/or Building Inspector to review code requirements prior to submittal of building permit application.